Great menus are one of the keys to a successful school nutrition program. Menus must offer variety, appeal to students, fit within your budget and meet federal guidelines. 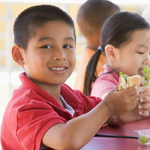 The Healthy Hunger-Free Kids Act of 2010 brought about changes that reflect the most current dietary science as outlined in the 2010 Dietary Guidelines for Americans and will result in healthier children. Everyone can use ideas to enhance their menus so we have included some sample menus as well as recipe resources to improve the appeal of your menus to students. The Smarter Lunchrooms Movement was started in 2009 with the goal of modifying school lunchrooms by applying research-based principles that promote smarter food choices by children and which result in more healthful eating at minimal or no additional cost to schools. The "Smarter Lunchrooms Self-Assessment Scorecard" is now a part of the HealthierUS School Challenge.